Heather Bakken first met Rick Hansen 25 years ago, during the Man in Motion's world tour, when she was a university student. Then her own experience with a spinal cord injury made the occasion a little more personal. Her thoughts. 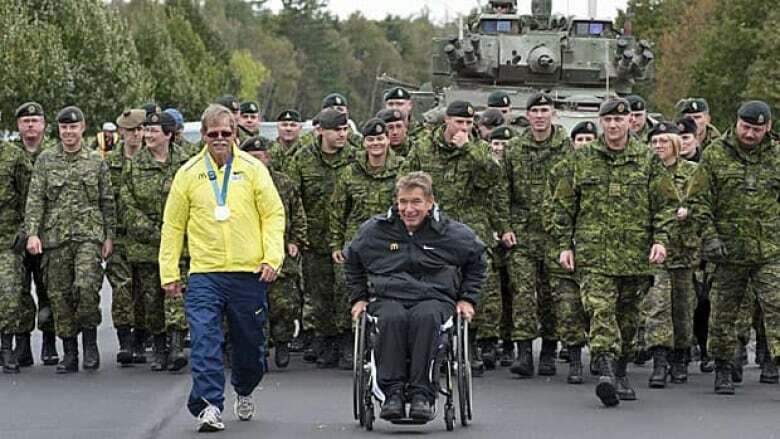 Rick Hansen and members of the Royal Canadian regiment at Cape Gagetown, N.B. in early October 2011. At his right is Mike Galey, one of the relay runners who is helping to recreate the Man in Motion tour from 1986. By November, the relay had moved West into Ontario. "Never give up on your dreams." That has been Rick Hansen’s motto and I was one of those who had the privilege of seeing it being lived out 25 years ago during his initial Man in Motion World Tour. It was bitingly cold and a blizzard was pushing its way through Southwestern Ontario that day as Rick was wheeling down an empty highway on the outskirts of St. Thomas. I was a university student and a mutual friend had invited me to meet the team. From inside the Man in Motion Winnebago I could see a crowd of students at the next scheduled stop, jumping up and down on the side of the road to keep warm and to cheer Rick on. It was hard to see his reaction through the windshield because visibility was so poor, but theirs was telling. As soon as he stopped moving, they stopped moving. The cheers turned to smiles. His presence just had that kind of mesmerizing effect. At that point, Hansen was in the final stretch of a 40,000-kilometre trek that would take two years to complete. The depth of his commitment to raise awareness about spinal cord injuries and money for research left me in awe. Little did I know then that his work and his legacy would become much more personal. In 2004, I suffered a spinal cord injury. The condition is called cauda equina syndrome and it causes partial paraplegia. According to medical textbooks, if it’s not operated on within 48 hours the symptoms are irreversible. CBC News writer Heather Bakken and Rick Hansen at the Lyndhurst Spinal Cord Rehabilitation Centre in Toronto on Nov. 6, 2011. An ambulance rushed me to Toronto Western Hospital late one Sunday evening. The hospital is considered one of the best trauma centres in the country for neurosurgery, which means it’s also busy and there were other patients with more serious injuries at the head of the queue. Still, in spite of the delay, the post-operative prognosis was good. My surgeon, Dr. Michael Tymianski, said I would probably walk again, and he was right. But all I could see were the difficulties that lay ahead — I was a sole-support parent, it wasn't clear how long I would be out of commission and the residual nerve pain was excruciating. That's when Rick Hansen kind of entered my life again. A few days after my operation, I was transferred to the Lyndhurst Spinal Cord Rehabilitation Centre in central Toronto to learn how to walk again. It’s the largest spinal cord rehab centre in the country, with 60 beds, and it has Hansen's imprint all over it. His foundation has provided the centre with sports equipment, computers, gear for people learning practical skills to help them lead a normal life, and therapeutic gardens to give those undergoing rehab the incentive to get outside. The strategy and infrastructure that he has helped create to improve recovery and find a cure now spans the globe and reaches everywhere from the Petri dish to clinical practice. Spinal cord Injuries are great equalizers. They can afflict anyone, anywhere, anytime. A cruel twist of fate had united me with three other women from very different walks of life. The Sikh lady diagonally across from my bed didn’t speak a word of English, so a translator accompanied all the medical staff attending to her. She kept her radio tuned to an Indian station 24/7. The elderly lady across the room was a post-War Italian immigrant who couldn’t speak a sentence of English. Her two children and their families were always at her bedside to make sure she was comfortable. The lady to my right had a delightfully rich Jamaican accent, which I had trouble understanding, but she still managed to make me laugh. Though we had nothing more in common than a lack of mobility and the debilitating nerve pain that accompanied it, we encouraged each other to move forward. During physiotherapy sessions in the gym I caught a glimpse of the extent of the injuries that afflicted most of the patients there. More than 250 people with spinal cord Injuries are admitted to Lyndhurst each year — most of them don’t walk out. On Saturday, I returned to Lyndhurst for the first time since my recovery. Rick Hansen was passing through with the relay marking the 25th anniversary of the Man in Motion World Tour. I half expected to see a bit of hubris on his part, after all his achievements. But Rick brings only humility. He told us that no one recovers in isolation. It takes a village of friends, family and practitioners to help those with spinal cord injuries reclaim their dignity and their lives. And while he emphasized the need to remain optimistic about a cure, he reminded us that we are full human beings with or without a complete recovery. After I made a commitment to myself during my recovery that I wouldn’t give up, the path to success became clear. Sure, there were a few bumps along the way, but in those moments I often thought about the man in the snowstorm who inched his way across the planet one glove stroke at a time. 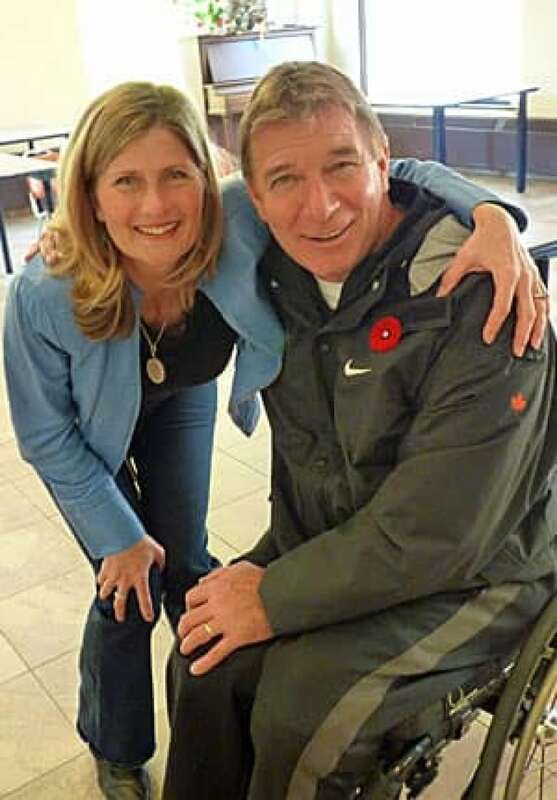 Rick Hansen is my hero, and I know I am not alone in saying that.